The GOP health care plans, debated in 2017, offered some preexisting condition protections, but they were not as comprehensive as those in the Affordable Care Act. Mulvaney and Sanders made their comments on Sunday political TV talk shows in reaction to questions about the Trump administration’s decision to ask federal courts to find the ACA unconstitutional and nullify the entire law. The administration has now fully sided with plaintiffs in the Texas court case. 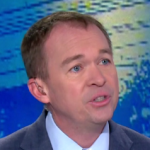 Mulvaney, March 31: Every single plan that this White House has ever put forward since Donald Trump was elected covered preexisting conditions. Every single plan that Republicans in the House voted on in the previous Congress covered preexisting conditions. Every single plan considered by the Senate covers preexisting conditions. We don’t think [Democrats will] work with us unless this court case proceeds and Obamacare is found to be unconstitutional, which is what we believe. Sanders, March 31: Trump has an idea on health care. His idea is to throw 32 million Americans off of the health insurance they have, doing away with insurance for kids who are 26 years of age or younger who are on their parent’s plans, doing away with the protections that the ACA has for preexisting conditions, Margaret. That means if you have cancer, you have heart disease, you have diabetes. If Trump gets his way the cost of health insurance for you will be so high that many people literally will not be able to afford it. Thousands of people will literally die. That’s Trump’s health insurance plan. Sanders’ claim about 32 million losing insurance shows he is referring to a repeal of the ACA without any replacement, while Mulvaney is talking about some kind of replacement plan including protections for preexisting conditions. The 32 million figure refers to a Congressional Budget Office estimate of the effect of the Obamacare Repeal Reconciliation Act of 2017, which would have repealed the ACA entirely and offered an unspecified replacement at a later date. The CBO estimated the bill would increase the number of uninsured by 32 million people over 10 years. But the CBO didn’t say that the bill would “throw 32 million Americans off of the health insurance they have,” as Sanders claimed. Some would choose not to have insurance. “In the nongroup market, some people would choose not to have insurance partly because they choose to be covered by insurance under current law to avoid paying the penalty,” CBO said. Sanders mentioned the popular ACA provision that allows young adults up to age 26 to stay on their parents’ insurance plans. The three major GOP plans from 2017 included that provision as well. As for preexisting conditions, despite what Mulvaney said, the debate isn’t over. The GOP health plans didn’t offer the same level of protection as the ACA does. Under the ACA, insurers can’t deny coverage or charge more based on health status. That protection primarily impacted the individual market, where those without employer coverage buy their own insurance and where, before the ACA, denials or higher premiums for those with medical conditions were commonplace, as this brief from Georgetown University’s Center on Health Insurance Reforms explains. The American Health Care Act, a bill proposed by House Republicans, required insurance companies to offer coverage regardless of preexisting conditions; however, they could charge more in certain instances. As we explained in 2017, when Congress was considering the GOP plans, the AHCA would have required insurers on the individual market to charge 30 percent higher premiums for one year, regardless of health status, to those who didn’t have continuous coverage, defined as a 63-day lapse over the previous 12 months. Plus, states could obtain a waiver that would allow insurers to charge even higher premiums to those with preexisting conditions who didn’t maintain continuous coverage. Those policyholders would be charged the higher premium based on their medical status for one year, and then, provided there wasn’t another 63-day gap in coverage, they’d get a new, less expensive premium not priced on health status. Also, the ACA requires insurers to cover a list of 10 essential benefits, but the House GOP bill would have given states the option of setting their own essential benefits. So, it would be possible for certain services not to be covered. The House passed the AHCA on May 4, 2017, but the Senate considered different health care bills, which failed in that chamber. In the Senate, the Better Care Reconciliation Act would have required insurance plans on state and federal marketplaces to offer coverage regardless of preexisting conditions, but insurers could have sold non-compliant plans on the individual market outside of those marketplaces. The non-compliant plans could deny coverage or charge more based on health status. We don’t know what a future GOP replacement plan might stipulate. Sanders said those with cancer, heart disease or diabetes would pay more under Trump’s plan, but in the GOP plans put forth so far, not everyone with a preexisting condition would pay higher premiums. As we’ve explained, insurers could only price plans based on health status under certain conditions. However, the 2017 bills didn’t offer the same level of protections as the ACA. "Every single plan that Republicans in the House voted on in the previous Congress covered preexisting conditions. Every single plan considered by the Senate covers preexisting conditions."